HOUSTON — Boeing has thrown open the hatch to its new commercial spacecraft, offering a first look inside the capsule it is building in a bid to fly NASA astronauts to the International Space Station. At its Houston Product Support Center located near NASA's Johnson Space Center, Boeing revealed its first full-scale model of the CST-100, a gumdrop-shaped spacecraft that can seat up to seven crew members. Astronauts Randy Bresnik and Serena Aunon donned the same type of pressure suits for the fit checks as were last used two years ago aboard the space shuttle. "This is our second iteration, our 'Phase 2' iteration, of the interior of the vehicle," Tony Castilleja, a Boeing CST-100 mechanical engineer, told collectSPACE.com. "Basically to rapid prototype it and have the NASA customer give us feedback — the NASA customer being the end user, the NASA astronauts." To design the CST-100 space capsule and the interior of its crew cabin, Boeing engineers drew from the company's experience as the lead space shuttle contractor, as well as its heritage building the command module for NASA's Apollo program and its rejected bid for the agency's Orion crew exploration vehicle. The CST-100, however, is a new breed of spacecraft — a commercial vehicle that is owned, operated and partially-funded by the company, rather than by NASA. Boeing is one of three U.S. companies, including Space Exploration Technologies (SpaceX) and Sierra Nevada Corporation, competing for NASA's business to ferry astronauts to and from low Earth orbit. To date, NASA has awarded Boeing $570 million to design and develop the CST-100. View inside Boeing's mockup of its CST-100 commercial capsule designed to take astronauts to low Earth orbit. "The interior of the vehicle brings out the best of Boeing. The floor and what we call the seat struts, the seat pallet where the seats sit, were built by our Boeing commercial airplanes folks," Castilleja explained, adding that while the mockup's console was sourced from Bigelow, its display panels were provided by Boeing's St. Louis division. "So the entire company is bringing their best and brightest to help us," he added. "This is not only a Houston-centric project but [involves] the entire Boeing company." The surprisingly-spacious module has room for two rows of crew seats and cargo storage, including a freezer used to transport science experiments to and from the station. In its current configuration, the capsule seats five, trading two additional seats for more cargo room. The flight controls, which are mounted on a console that is suspended above the front row seats, employs shuttle-era switches and hand controllers, augmented by touch-panel digital displays. A window located forward of the control console offers the pilots a view, with additional portal windows to either side. A side hatch allows entry and exit into the cabin, while an overhead hatch leads into the space station after docking. Missing, at least for now, from the CST-100 mockup is the waste containment system, or toilet. "We have a couple of options," Castilleja described. "It is all about reducing mass, so we do not have a true space toilet like shuttle did because we just don't have the room in this vehicle. But there are some design alternatives that we're looking at, from diapers to mechanical devices." What the CST-100 mockup does have however, is lighting — specifically Boeing's "Sky" blue-tinted LED lighting, as currently found on its newer line of commercial airliners. "The Boeing look is on purpose," Castilleja said. "You are going to get the same look and feel as you are flying on a 747 as you are flying on a spacecraft." Boeing says its first piloted orbital flight of the CST-100 is planned for 2016. NASA, based on funding availability, is expecting to begin buying seats on commercial-operated flights to the space station starting a year later. The space agency is Boeing's core customer for the CST-100, although the aerospace company has also partnered with the space tourism company Space Adventures and Bigelow, which plans to deploy its own commercial space station built using inflatable modules. Regardless of the destination or mission, Boeing plans to launch the CST-100 atop a United Launch Alliance (ULA) provided Atlas V rocket. The reusable capsule is designed to return to Earth using parachutes and airbags for a soft touchdown on land. If, in the unlikely scenario an emergency water landing is needed, the CST-100 can also float. Boeing, working with NASA and Department of Defense personnel tested water recovery techniques using a different mockup at Bigelow's Las Vegas facilities earlier this month. 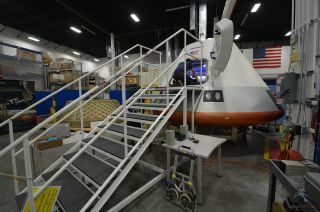 Click through to collectSPACE.com to see more photos from inside Boeing's CST-100 commercial space capsule.